Seven years of extensive research and work with clients went into this groundbreaking, original new approach to Lilith. We have been taught to fear the feminine and diminish, control, or abuse it when we find it flowing in its natural state. The current treatment of women and all that is considered feminine – including the planet itself – is the result. It is possible to come out of these ways of being but we must honor and accept the wild feminine as it exists within us. This means learning to deal with the reality of intense emotions and what inside us resists control. Our training over the last few thousand years on Earth has brought us to think we should respect only what the mind offers and this teaching on Lilith opens a door into getting back into our bodies and learning to love ourselves for carrying the wild in our bodies and personalities. We are extensions of the Earth in body and soul – and we’re ready to embrace and celebrate it. 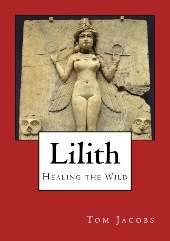 Lilith: Healing the Wild is a must-have for anyone interested in goddess work and healing the feminine, creating equality and justice on the planet for women and all that is feminine, and all those carrying millennia-old pain about the diminishment of the feminine. Order a signed copy or the PDF e-book here, via Amazon (in the next few days), or Kindle. Tom Jacobs is an Evolutionary Astrologer, Medium, and Channel helping you understand and do what your soul came here to do and give you insights into and tools for healing and making it happen. Eleven books, two original natal reports, and numerous astrology and channeled MP3s are available through tdjacobs.com. Join Ascended Master Djehuty for a Full Moon Grounding & Release call on 03Jun12 near the Sagittarius Full Moon to release beliefs you no longer need so you can be more fully present and in compassionate charge of your life.